If there was a simple test that could give you an early warning about whether you're likely to have this disease, would you take it? The good news is — there is! Since early detection has been shown to increase the survival rate of oral cancer to 80% or better, this test can truly save lives. And best of all, getting an oral cancer screening is part of something you should be doing anyway: coming in for regular dental checkups. 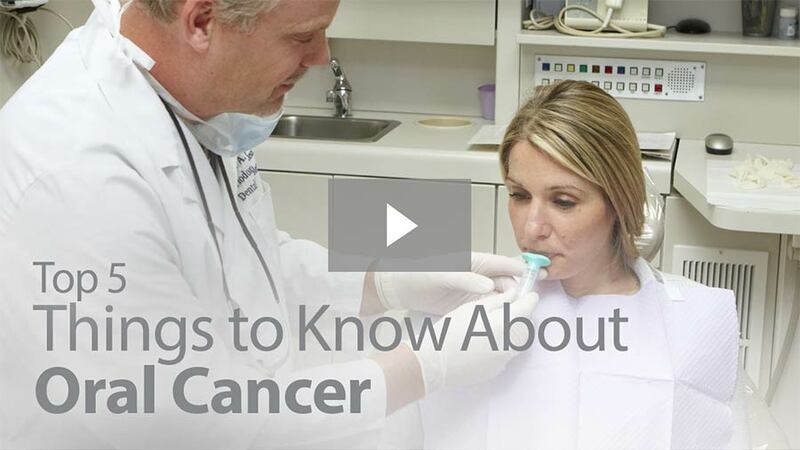 An oral cancer examination, performed in our office, is fast and painless. We have been specially trained to identify small changes in the tissue of the mouth, lips and tongue that may signify the early stages of this type of cancer. The screening is primarily a visual and tactile (touch) examination. If we note any abnormalities, a small tissue sample can be retrieved for further testing in a laboratory. A thorough screening for oral cancer is part of your routine dental examination — another reason why you should come in to our office regularly. During the test, we will visually examine your lips, tongue, and the inside of your mouth, and check for red or white patches or unusual sores. We will feel for lumps and swellings, and gently pull the tongue aside to get an even better view. We may also use a special light, dye, or other procedure to help us check any suspect areas. If we find anything out of the ordinary, a biopsy can be easily performed. If you notice abnormal sores or color changes in the tissue of your mouth, lips and tongue, they may be a symptom of oral cancer — most, however, are completely benign. But sores or other unusual changes that haven't gone away by themselves after 2-3 weeks should be examined in our office. Remember, the only way to accurately diagnose oral cancer is through a laboratory report. Early diagnosis, aided by thorough screenings at your regular dental checkups, is one of the best defenses against oral cancer.